Seeing how people ate up the first version, Aoshima has released another 1/12 action figure of the famous T-800 Terminator. This figure is the version we all know and love that has appearing in all Terminator films and the TV show. Two versions of this figure have now been released by Aoshima. One being the standard silver/chrome version and the other being a much darker more menacing looking gunmetal colored version dubbed T-800 type 2. Aoshima has graciously provided us with samples of both versions that can be purchased at their website here. 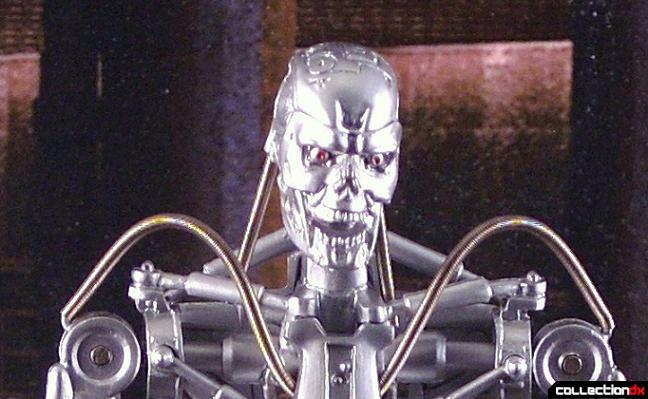 Today's review will focus on the standard T-800 that we are all familiar with. First up is the quality window box packaging that allows you to clearly view the figure you are purchasing. In my opinion this type of box is the best because it leaves alot of the guess work out when you think to yourself, "I wonder what this figure looks like in the box?" and "how tall is the figure?". Moving along, on the back of the box you have a clear illustration of the easy to assemble figure that requires zero translation to understand. Upon removing the figure from the box a doing the very minor assembly you are quickly rewarded with what is a great looking Terminator Endoskeleton. The figure is made of high quality PVC and stands approximately 7 inches tall. The figure also is highly articulated with as far as I can tell, no less that 16 points of articulation! The figure also includes an extra hand used for holding the two guns that are included. One being a plasma gun and the other being what appears to be a stockless pump shotgun (not shown). As you can see in the photo's below the figure is very well balanced and the articulation allows some cool poses. Also, take note on the highly detailed surfaces, pistons, and hoses that give this figure a certain realism not found in many PVC figures at the 2580 yen price point. Both versions together! Notice the family resemblance? The cool background in the photos was provided by our friends over at Action Figure Displays. You can get this background as well as many others at their site. In conclusion, I feel that Aoshima has succeeded in pulling off a reasonably price quality action figure that is detailed, poseable, and fun. Who could ask for anything more? Think I like the darker gunmetal-gray version better; just looks meaner. I am going to have to agree with you Eva, The darker one just looks more ominous and scarier.